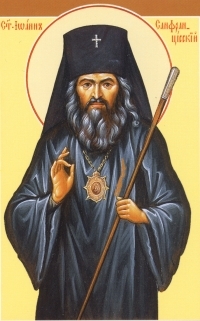 Our Brotherhood was formed with the blessing of Archimandrite (now Archbishop) Peter on February 2, 2003. Our Brotherhood exists to support the Mission of St. Vladimir Church, namely "It shall be the aim of the parish to unite the believers around the parish church on the basis of the teachings, the canons, the traditions and the rules of the Russian Orthodox Church for the satisfaction of the religious need and moral benefit of its members." In addition, we strive, along with the rest of our Parish Family, to spread the Orthodox Faith to those living in Washtenaw County, MI. The Brotherhood provides the opportunity for the men of our parish to interact socially in a positive way as they support the parish and its goals and institutions. Specifically, the Brotherhood fulfills a list of duties before the Sunday Divine Liturgy. These duties are shared by all brothers on a rotating basis. Additional duties of the Brotherhood revolve specifically around the Divine Services (bearing the banners at Cross Processions, aiding the believers in finding space in the church, a place for their coats, helping with parking, providing rides for those without transportation, etc.) and the maintenance of the Church (repairs, special projects both inside and outside the church). The Brotherhood sponsors work days at the Church for all St. Vladimir's parishioners and friends on a regular basis. The Brotherhood also supports our Sisterhood in their work, and performs many duties on an ad hoc basis. Finally, the Brotherhood has fun! Join us and see! Yearly dues are nominal ($50) and are used to help pay for Brotherhood activities and projects. More information about our heavenly patron, St. John of Shanghai & San Francisco can be found below. The feast of St. John is celebrated on the day established by the Council of Bishops of the Russian Orthodox Church Outside of Russia, namely, the Saturday nearest his repose (June 19/July 2). All members of the Brotherhood are strongly encouraged to participate in the feast day of their heavenly patron by partaking of the sacraments of Confession & Communion on the feast day itself.